Logo for EETG designed by James Brown. 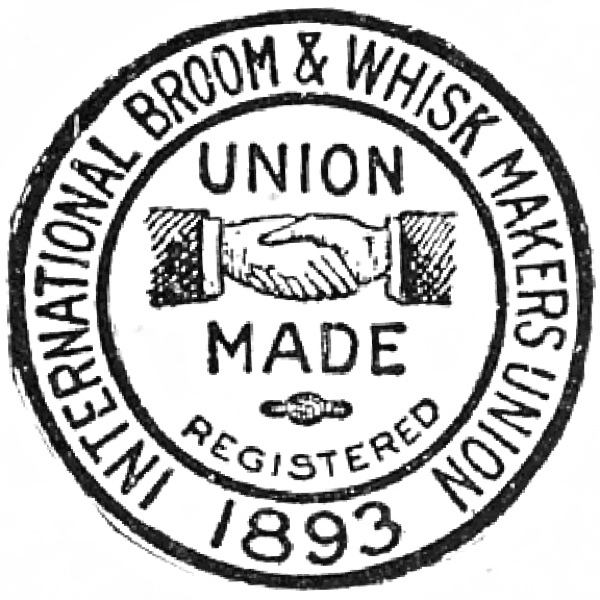 The Broom & Whisk Makers Union design that inspired the EETG logo. 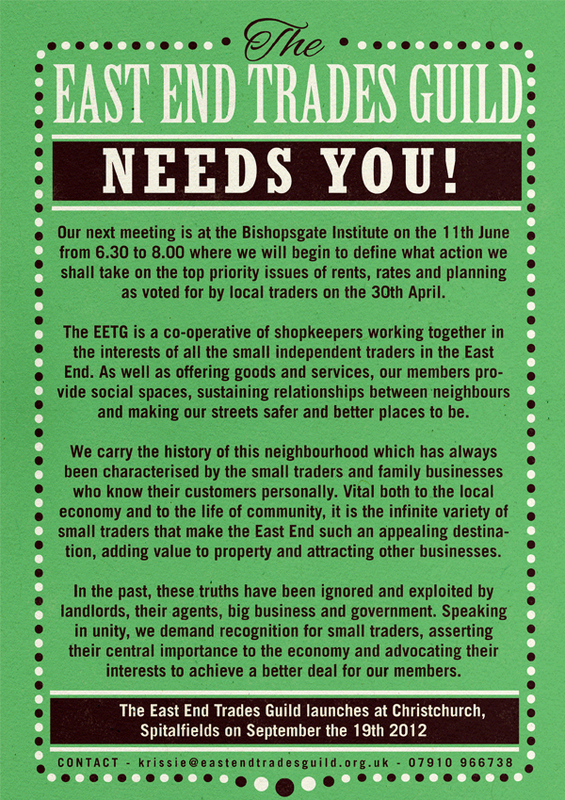 Around thirty independent shopkeepers and small traders met at the Bishopsgate Institute at the end of April to consider the potential for the East End Trades Guild as an advocate for their collective interests. When the issues facing their businesses were prioritised, it became apparent that rents, rates and planning were the subjects of greatest concern to those at the meeting. Next Monday 11th June at 6:30pm, the traders will meeting again at Bishopsgate Institute to discuss these three issues further and explore what specific action can be taken to address them. All independent shopkeepers and small businesses in East London are invited to attend and participate in these discussions as the East End Trades Guild moves towards its formal launch on September 19th at Christ Church, Spitalfields. Meanwhile, James Brown has produced a dignified and authoritative logo for the Guild which you can see above and, entirely fortuitously, a photograph of the Shoreditch Trades Council of one hundred years ago has surfaced. Until this picture appeared, no-one knew that there was a precedent for the East End Trades Guild, and its recent discovery presages well for this new endeavour. 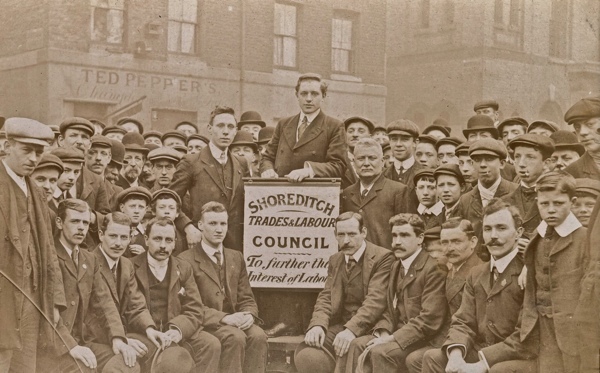 A recently discovered picture of the Shoreditch Trades Guild of a century ago. The East End Trade Guild Needs You! I’m not in retail and know very little about the pressures of running a shop, so the following idea might be naive or rubbish. Apologies if so, but I thought I’d air it anyway. You know how English Heritage confer listed status on buildings of architectural or historic interest? How about lobbying for a similar government-backed scheme to protect long-established small traders? So the trader would get some kind of protection against over-the-odds rent increases, and from nearby building developments that might be detrimental to trade. I don’t know what the best criteria for ‘listed trader’ would be…perhaps the shop is at least third-generation, or established in the same premises for over 50 years, or whatever. Totally agree with M@ but I also feel that the East End should not become a heritage site. I think that the East End is an evolving ‘High St’ in which new independent businesses should be protected from the same threats as the cherished long established businesses. Evolution on the High Street is a good thing as long as its not enforced by extortionate rents and compulsory demolition for redevelopment. I would like to see the East End stay a busy and vibrant place where individuality, old and new is embraced, and to keep the homogeneous outposts of Westfield at bay.